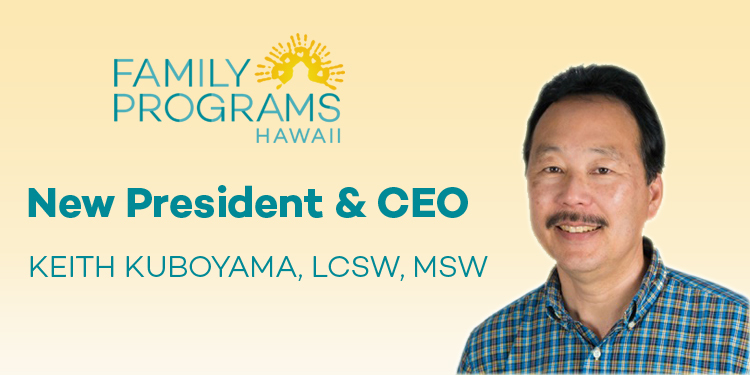 Honolulu, HI – As the Board Chair of Family Programs Hawaii (FPH), I am quite pleased to announce that Keith Kuboyama, LCSW, MSW, has been selected as the new President and Chief Executive Officer of Family Programs Hawaii effective September 1, 2017. Keith currently serves as FPH’s Executive Vice President and Vice President of Clinical Services, and has been part of the FPH `Ohana for almost thirty years, tracing back to FPH’s initial roots in Hawaii as Casey Family Programs. Keith was awarded a Master of Social Work by the University of Hawaii in 1986, and has been clinically licensed in Hawaii since 2004. In 2009, he completed a Non-Profit Management Certificate program at the University of Hawaii, and completed the Hawai’i Community Foundation’s Hawai’i Emerging Leaders Program in 2011. Keith was recognized as the 2016 Mental Health America of Hawaii’s Outstanding Community Leader. Most importantly, Keith is passionately dedicated to FPH’s mission of strengthening children and families involved in the child welfare system through high quality prevention, support, and transition services. Dr. Paulette Bethel, FPH’s current President and CEO, will be retiring. She and her husband, Ralph, plan to relocate to the mainland to be closer to their children and families. Keith’s assumption of President and CEO duties will coincide with the projected date of Family Programs Hawaii moving to its new Honolulu office in the KITV building on South King Street. To help with this seamless transition, Dr. Bethel will stay on through the end of September. Please join us in welcoming Keith to his new role as well as sending our mahalo to Paulette for all the support and guidance she has brought to Family Programs Hawaii during her successful tenure as our leader. Family Programs Hawaii (FPH) is a 501(c)(3) social service agency providing quality social services in Hawaii since 2004. FPH is led by President and CEO, Paulette Bethel, PhD, with a committed board of 13 directors, chaired by Stephanie Batzer, Esq., MSW. FPH is dedicated to strengthening children and families, especially those involved in the child welfare system, through high quality prevention, support, and transition services. FPH currently employs over 60 employees in its three facilities, located in Honolulu, Hilo, and Ma’ili. FPH believes in putting children first. We work with families to strengthen the family unit to achieve caring, loving homes, in which Hawaii’s children can thrive and succeed. FPH also believes that children entering the foster care system have the right to maintain their family connections. We are committed to partnering with the community to provide the highest quality, innovative and culturally competent services for our children and families.